Felix Stalder is Professor of Digital Culture and Networking Theories and studies how the Digital Condition is changing knowledge, and what this means for the education system. In your book entitled “The Digital Condition”, you give a new twist to the discussion on digitalisation. Your scientific and cultural approach focusses on societal processes rather than technologies. What exactly is meant by the “Digital Condition”, and where does it stand in relation to digitalisation? Digitalisation is a process that transforms analogue media (and those processes that are based upon them) into digital media. Digitalisation therefore deals with a process of transition from one state to another. The digital condition is one of these states. It is the condition that involves living and working and organising ourselves under the assumption that digital media are put to use in a comprehensive way. Digital media form the infrastructure for a digital condition, and they shape the social, cultural and political processes. It seems that we have already passed the peak of the digitalisation phase. The digital technologies are now omnipresent, and they have fundamentally altered the circumstances under which we live and work. I would describe these new circumstances as a digital condition. In your book, you emphasise the new elements that arise in the course of the digitalisation process. In your opinion, where are the most interesting opportunities arising at present? As far as I am concerned, one of the most fascinating questions involves the identity of those key new and economically powerful players who are able to appeal to a large number of users. They offer guidance to users in a massive, chaotic universe of information. These players provide users with the ability to process large amounts of information and to manage the way they deal with this volume of information productively – in the sense that users not only take in information, but can also express their own opinions, attitudes or value judgements in a way that is meaningful to other people. For me, this is one of the most attractive new areas of opportunity. Didn’t we always have something like this? Yes, of course, we have always been able to express our attitudes towards information and knowledge, but what we’re experiencing now is that this power of interpretation can become productive to a greater extent than ever before. This is because it can be distributed through networks. In turn, this produces the option of generating an enormous number of different information filters, which various people then find interesting and want to share around their own circle of contacts. What we’re experiencing here is a powerful cultural diversification. For the first time ever, even the more marginal and highly specialised interests can generate a critical mass of people, who can then work upon the relevant subject areas. In saying this, I’m simply setting out the structural possibilities. I’m not making any value judgements about how useful it might be to provide all of these interests with a platform. You say that the digital condition opens up new areas of opportunity, in that it expands the potential for individual opinions and value judgements to make themselves heard. In this new culture, could any areas of freedom that previously existed also be lost? One major challenge lies in the increasing fragility of the contextualisation of actions and observations – and some areas of freedom will certainly be lost as a result. Before the era of digitalisation, different rules clearly applied in different contexts, and we could select different forms of expression. The subjects I discussed with my doctor, the things I told my friends and what I said in a meeting at work – these matters were all kept within their separate contexts. Within each individual context, we could express ourselves, experiment and try out different roles, without having to consider the possibility of our actions becoming known within other contexts. This resulted in a greater area of flexibility for experiences and experiments within individual contexts. When the opportunities to try out new ways of thinking and behaving within a clearly-defined framework disappear, this does also lead to the loss of some important areas of opportunity. Right now, we are discovering that it has become very easy to transfer elements from one context to another. Statements made in the semi-private sphere can suddenly acquire a general political significance. Why is it that the different arenas and contexts are growing closer together again? There are several reasons why this is happening. On the one hand, this tendency is related to the very nature of the media. Everything now happens in the same medium (i.e. the Internet), where even the most varied of activities are only separated by one single search query. The second reason involves the change that has taken place in the world of work. More and more functions demand the involvement of the person as a whole; we can no longer do this work with an attitude of “I’m just doing my job here, but it doesn’t interest me in any way, and that’s really not what I am at all”. Activities that demand (and promise) the involvement of the entire person actively challenge us to break through the boundaries between our different contexts. This is where the discussion turns to the subjectivisation of work. Companies increasingly expect employees to devote themselves body and soul to their work. Would you regard that too as a manifestation of a digital condition? I would say that this is part of a larger historical transformation, which is being reinforced by digitalisation. The question of technology’s role in the social process is an old, but as yet unsolved, matter. There is a widespread view that technology enters into an existing process and changes that process. This is not, however, how development works. In my book, I try to show how social processes are set in motion for very varied reasons and in many different locations, and that they create new opportunities or constraints. One example of this type of process was a change in the world of work that reached back as far as the 19th century and in the first instance had nothing to do with computers, but had a great deal to do with the increasing complexity of working processes. Technologies accelerate these transformations, but they are not their initiators. First of all, there must be some concept of wanting things to change. There must also be a certain drive to take the effort associated with the change upon your own shoulders. During this process, the area of activity not only changes for the people actively striving for change, but for everybody else too. As soon as one new organisational and work-related paradigm has been introduced successfully, the pressure for change increases for all the other stakeholders too. The creation of any opportunity for change or any societal need for investment therefore depends upon the preceding dynamic within that society. This process is not initiated by the technology itself. What does this development mean for the education system? Where in the digital condition would tasks and challenges arise in respect of teaching adults? We’ll need to take a step back in order to answer this question. The issues involved in digitalisation as a period of transfer and the digital condition are characterised by an enormously high level of complexity, which is related to the fact that the simpler, more linear, monocausal explanatory models no longer apply. What this means can, for example, be illustrated by the ecological sector. We now live in a highly complex world and we try to adjust our social institutions to match this complexity. This has very direct consequences for the education sector. One of the key consequences for the structure of knowledge relates to the manner by which we experience things about the world, and how we make this knowledge accessible to other people. The classical method used in science and the critical discourse by which knowledge is generated depends upon distance: I need to maintain a certain distance from the phenomenon in order that I can reflect upon it. This is based upon the idea that a phenomenon is clearer and more visible when viewed from a distance than when it is seen close up, i.e. distance creates a certain detachment and the potential to produce an independent, critical reflection. However, this method only works if the object that you are studying from a distance is limited to a certain extent in terms of both size and internal complexity. Now, though, we are increasingly faced with phenomena that are enormously large and widely diversified, which means that they are extremely complex and dynamic. In this case, it is seldom still possible to create the distance required to evaluate a phenomenon with detachment. What we are now experiencing is a fundamental change in the way that knowledge is generated and depicted. The digital condition is understood as a status characterised by digital technologies, which are involved in the way that we experience things all over the world, and in how we are connected with the world; it allows us to form different relationships, seek new illustrative models and mistrust our current models. Things often come towards us far more directly, and in a form that is less filtered or is filtered differently from before. From this, can we infer that you see the way we deal with complexity as a key problem for the education system in a digital condition? I would see it like that, yes. Along with the increasing level of complexity, things become so multi-layered and interconnected that the character of each individual element becomes extremely variable. Depending on the context in which they are located, it may be that they are hardly recognisable as individual phenomena any longer. The positions taken by observers are also extremely important, because they too play a part in creating the interconnections. They look different from different locations and viewpoints, which gives the overall picture an additional dynamic impetus and increases the level of complexity still further. If the level of complexity grows yet again, does the level of power of those people who are able to handle it grow too? Doesn’t this expansion of power present a problem? The growth in power is certainly enormous and it may be problematic from a democratic point of view. But I regard the fact that we (as a collective entity and as a society) retain the ability to understand and intervene in highly complex problems as a fundamentally positive development. Take the use of resources, for example: we can no longer argue that things appear out of nowhere and that after we’ve used them, they then disappear into nowhere again without trace. This was certainly the attitude we adopted in the past two hundred years, but we now need significantly more complex ideas about circulatory systems and interconnections in order to be able to understand and modify our use of resources. It is an enormous challenge for our society and institutions to develop these extremely complex concepts. This challenge needs to be approached simultaneously on many different levels, including the epistemological level: How do we know anything at all about the world? And how do we pass on this knowledge to others? How can we generate it in such a way that it becomes accessible to other people? As a cultural scientist, you analyse this complex development from a distance. However, you also teach at an educational institution, and you are yourself therefore confronted by the effects of digitalisation in educational practice. Where are you met by the digital condition in your day-to-day activities as a professor? I encounter the digital condition most of all when I’m dealing with those areas where my students know far more than I do. The complexity of these objects and fields has increased so much that I would be fooling myself if I thought I could possess all the specialist knowledge they involve. The students really do know many things that I do not know. They can dig far deeper into a specific subject area than I can, because I’m occupied with producing an overview and providing the students with the ability to deal sensibly with their own specific knowledge. My task as a professor includes the need to embed the decontextualized knowledge obtained by the students from search machines into a well-considered, larger context. Where does that knowledge come from? Where is it going? Why has it turned up in this or that context? In conclusion, I would very much like to take a look into the future. If you were given the task of designing the educational system of tomorrow, what would you do with the educational institutions? Would you re-shape them – or would you maybe abolish them altogether? I would certainly not get rid of the institutions altogether. I am convinced that it is still the duty of the education system to facilitate social mobility. A good state educational system plays a crucial role in softening the rigid stratification of society. In order to accomplish this task, we who work in education must provide students with the ability to handle standardised situations, as well as to articulate the individual specifics. It’s not enough for us to offer a foundation-level participation course and to think that everyone will then be equipped to participate in the social processes. In order for us to be able to overcome the complexity we face, we need both elements – a certain level of standardisation, in the sense that we are dealing with the same situations that are shared by other people too; and a confrontation with the individual and specific. Nevertheless, we do also need to apply boundaries to individualisation. The way in which we currently see ourselves in relation to digital media allows individualisation to go so far that people seal themselves inside their own worlds, with the result that they no longer have much idea of the worlds in which other people live. 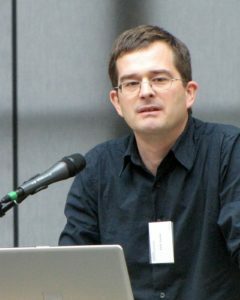 Felix Stalder is Professor of Digital Culture and Networking Theories at the Zurich University of the Arts and author of a book entitled “The Digital Condition” (Image: Wikipedia, CC BY-SA 3.0).